Lawyers today are in a moral crisis. The popular perception of the lawyer, both within the legal community and beyond, is no longer the Abe Lincoln of American mythology, but is often a greedy, cynical manipulator of access and power. In "The Lawyer's Myth", Walter Bennett goes beyond the caricatures to explore the deeper causes of why lawyers are losing their profession and what it will take to bring it back. Bennett draws on his experience as a lawyer, judge and law teacher, as well as upon oral histories of lawyers and judges, in his exploration of how and why the legal profession has lost its ennobling mythology. Effectively using examples from history, philosophy, psychology, mythology and literature, Bennett shows that the loss of professionalism is more than merely the emergence of win-at-all-cost strategies and a scramble for personal wealth. It is something more profound - a loss of professional community and soul. 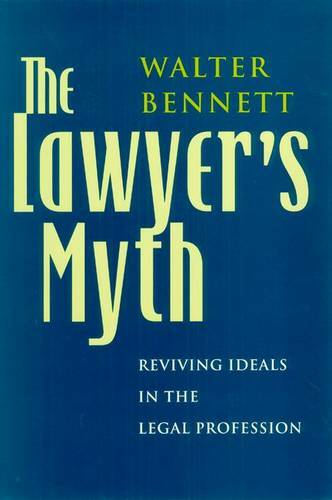 Bennett identifies the old heroic myths of American lawyers and shows how they informed the values of professionalism through the middle of the last century. He shows why, in our more diverse society, those myths are inadequate guides for today's lawyers. And he also discusses the profession's agony over its trickster image and demonstrates how that archetype is not only a psychological reality, but a necessary component of a vibrant professional mythology for lawyers. At the heart of Bennett's eloquently written book is a call to reinvigorate the legal professional community. To do this, lawyers must revive their creative capacities and develop a meaningful, professional mythology - one based on a deeper understanding of professionalism and a broader, more compassionate ideal of justice.